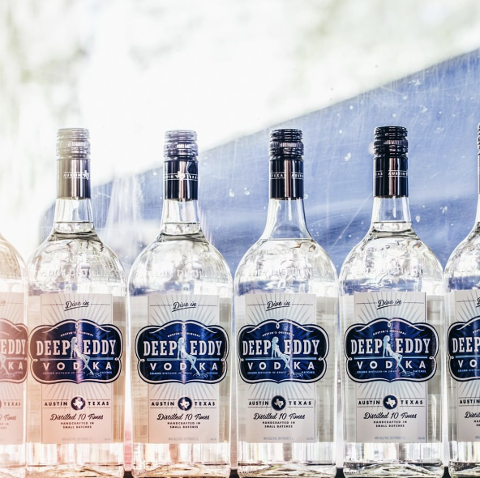 The best way to spread Christmas Cheer, is singing loud for all to hear…& that’s exactly what we’ll be doing on the Deep Eddy Vodka Drag Queen Caroling Cruise! Grab your family and friends, throw on some holiday attire and join us as we “double-deck the halls”! 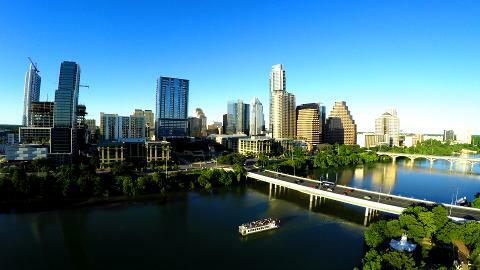 It’s the perfect way to see our beautiful city with locals and visitors while sharing Holiday cheer with all Austinites! 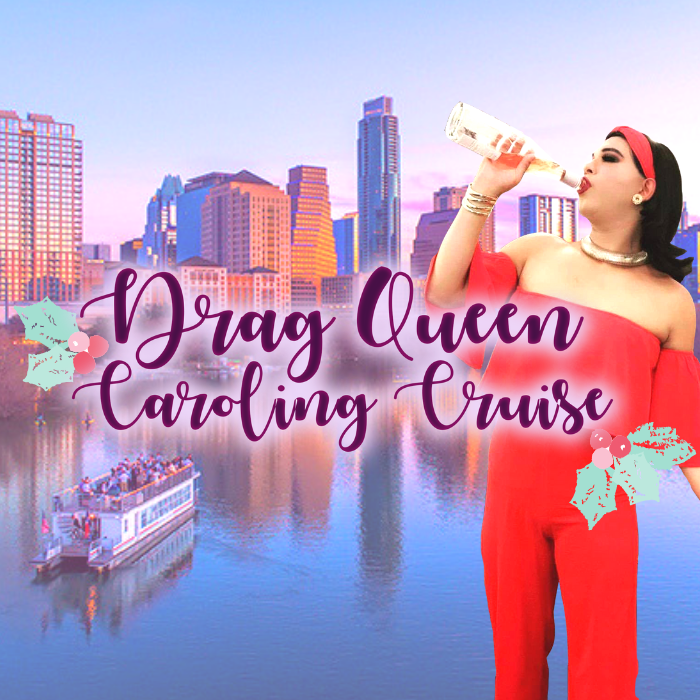 This two-hour ride on Capital Cruises double decker boat on Lady Bird Lake features performances and sing-a-longs of Holiday favorites with our Drag Queen, the feisty and fabulous Colleen Deforrester. We'll have our resident DJ alongside her mixing holiday beats. Colleen will perform a few numbers on her own and we’ll all join in with her for other holiday favorites. We’ll have caroling songbooks for those that don’t remember the lyrics! All of the above included for only $39! … Santa Baby, I want a yacht and really that's not a lot! Want to hang out with us all day? 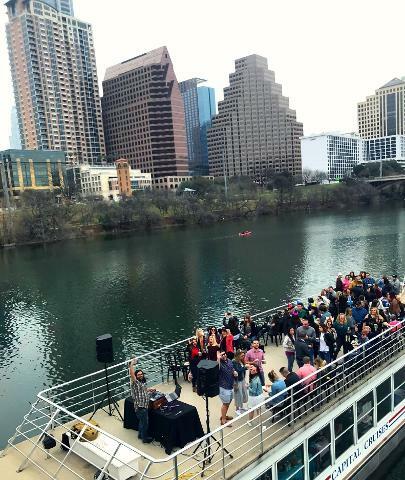 Don't miss our Brunch Boat with Buddy the Elf! We will hold Check in at The Hyatt Regency Austin from 2:15-2:45 PM at their downstairs bar, Marker 10. Arrive early to enjoy the $8 Jameson + Coffee, Cider or Hot Coco Bar & Dessert special for Austin Tour Company guests! 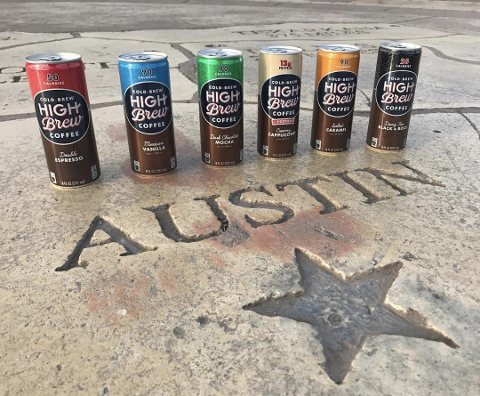 We encourage our guests to eat lunch beforehand - regardless of where they call home, all Austin Tour Company guests get the “Locals Only” Discount at Marker 10: 10% off all food! 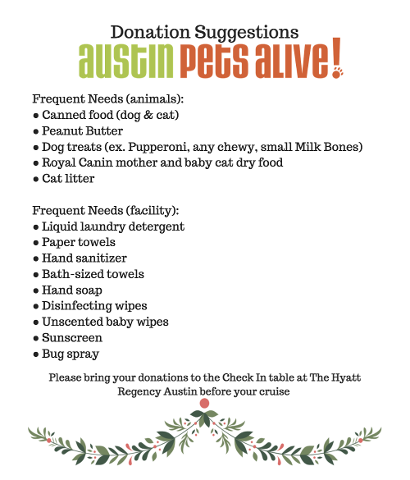 We are partnering with Austin Pets Alive to support our 4-legged friends this season! Bring an item to donate from the list in the event photos, and you’ll be entered for a chance to win amazing prizes! Street parking is available, and free on Sundays - Guests may also park at The Hyatt’s parking garage - be sure to ask your Austin Tour Company guide for a $10 flat-rate parking voucher! Want to sip and shop for Holiday gifts? 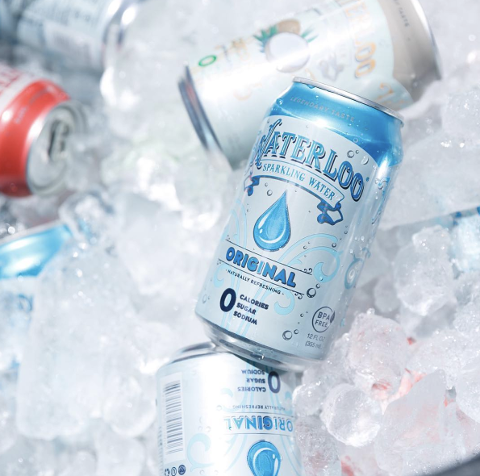 Austin Tour Company guests also get a free drink at the nearby YETI Flagship Store & Barrr with the purchase of $20 or more of YETI products! Please bring your ID. This is event is 21+ only. All We Want for Christmas is for you to join us on the Drag Queen Caroling Cruise! Don’t miss out on one of the most unique experiences of the Holiday Season, grab your tickets now! Follow us on Facebook and Instagram for updates and pics from our experiences! Thanks to our partners, 365 Things Austin, for helping to make this event possible! As locals know, our weather can be very unpredictable! All Holiday Brunch Boats will run, rain or shine. The lower deck is climate controlled and always a cozy place to warm up if needed! Refund and Reschedule Requests will be honored if made 72 hours or more before the departure date/time of the boat. Ticket transfers/Name changes are always permitted.